Aim. The need to revise the views on the tectonic evolution of the Earth is caused by dissatisfaction with its modern paradigm - the tectonics of lithospheric plates. The purpose of this article is a healthy critical analysis of the fundamental principled discussion points of the concept of plate tectonics and the hypothesis of the hot belts of the Earth. Methodology: Analysis of the essence of the hypothesis of the hot belts of the Earth and the concept of plate tectonics, and discerning the main advantages and disadvantages that determine their capabilities. Chronological analysis and correlation of geological structures of the Earth have been made in connection with the spatial location of their intersecting paleomagnetic equators, reflecting corresponding geotectonic episodes, and catastrophic events in the evolution of the Earth. Results. Due to the multiplicity (instability) of the results of its solution, the inconsistency of the basic dynamic premise of the tectonics of lithospheric plate - mantle convection is shown. As an alternative, we considered the migration of the solid shell of the planet along the liquid-phase roof of the outer core and the lower asthenosphere being under the influence of a rotational-gravitational mechanism. Convection mixing of the mantle substance and the subduction-induced displacement of the lithosphere derived from it remain outside the discussion. The rotational-gravitational regime of the Earth appears to be the principle mechanism influencing the structural transformation of the tectonosphere, which led to the formation at maximums of different-aged and multidirectional antiforms of equatorial swells of the planet of rotational riftogens. Originality. In terms of the degree of self-sufficiency, the proposed hypothesis of the hot belts of the Earth is represented as a missing link between the antipodal geological worldviews: fixism, whose established scientific canons have remained inviolable, and mobilism in its new transcription, on the basis of dynamic rotational-gravitational mechanisms and the accompanying deep subnuclear magmatism. Practical significance. Crossing different age structures by paleoequators led to the formation of riftogenic nodes and their anomalous associations in various regions of the world, within which the largest industrial accumulations of hydrocarbons are known. The analysis of riftogenic nodes as outlets of migration of deep fluids and zones of unloading deep energy, will allow to unconventionally approach the development of a new strategy for the search for hydrocarbon raw materials. Anfilogov, V. N. Mantiynye plyumy: uroven' generatsii i mekhanizm peredachi energii k poverkhnosti Zemli [Mantle plumes: the level of generation and the mechanism of energy transfer to the Earth's surface]/ V.N. Anfilogov, Yu.V. Khachay // Fundamental'nye problemy geotektoniki. Materialy XL tektonicheskogo soveshchaniya Tom I. [Fundamental problems of geotectonics. Materials of the XL Tectonic Meeting, Volume I] Moscow, GEOS, 2007, pp. 18–21. Avsyuk Yu. N., Suvorova I. I. Fakticheskoe obosnovanie tsiklichnosti khoda prilivnoy evolyutsii sistemy Zemlya-Luna-Solntse [The actual substantiation of the cyclicity of the course of the tidal evolution of the Earth-Moon-Sun system] // Fundamental'nye problemy geotektoniki. Materialy XL tektonicheskogo soveshchaniya Tom I. [Fundamental problems of geotectonics. Materials of the XL Tectonic Meeting, Volume I], Moscow, GEOS, 2007, pp. 3–6 (in Russian). Belevtsev R. Ya., Blazhko V. I., Tereshchenko S. I. O termodinamicheskoy evolyutsii zemnoy kory i tektonike plit [On the thermodynamic evolution of the earth's crust and plate tectonics], Geofizicheskiy zhurnal [Geophysical journal], 2016, 38, no. 6, pp. 118–136 (in Russian). Belousov V. V. Osnovy geotektoniki [Fundamentals of geotectonics]. Moscow, Nedra Publ., 1989. 382 p. (in Russian). Bugaevskiy G. N. Seysmicheskie issledovaniya neodnorodnosti mantii Zemli [Seismic studies of the heterogeneity of the earth's mantle]. Kiev, Naukova dumka Publ., 1978. 184 p. (in Russian). Dapeng Zhao Seismic structure and origin of hotspots and mantle plumes. Earth and Planetary Letters, 2001, v. 192, p. 251–265. 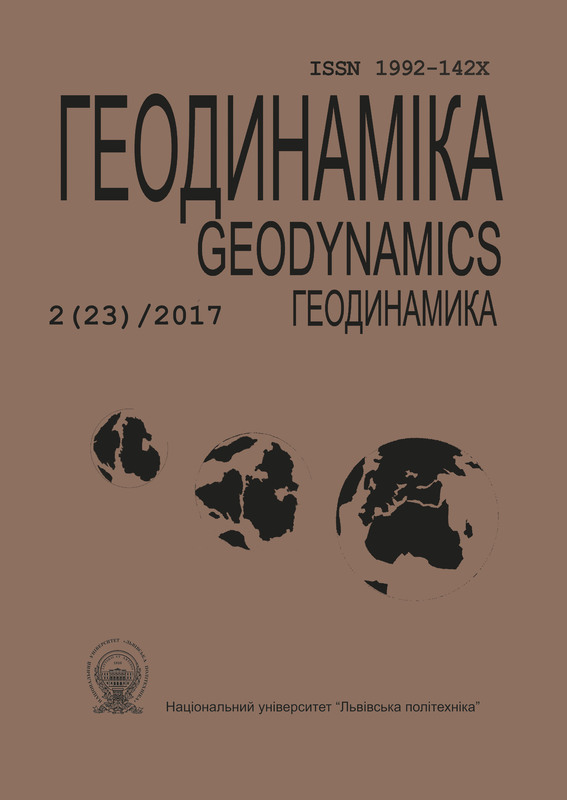 Dobretsov N. L. Global'naya geodinamicheskaya evolyutsiya Zemli i global'nye geodinamicheskie modeli [Global geodynamic evolution of the Earth and global geodynamic models] // Geologiya i geofizika [Geology and geophysics]. 2010. 51, No. 6, pp. 761–784. Dobretsov N. L., Kirdyashkin A. G., Kirdyashkin A. A. Glubinnaya geodinamika [Deep geodynamics]. Novosibirsk: Publishing house of the SB RAS, 2001. 409 p.
Filat'yev V. P. Energetika tektoniki [Energy of tectonics] // Fundamental'nye problemy geotektoniki. Materialy XL tektonicheskogo soveshchaniya Tom I. [Fundamental problems of geotectonics. Materials of the XL Tectonic Meeting, Volume I], Moscow, GEOS, 2007, pp. 321–324 (in Russian). Gordienko V.V. O gipoteze tektoniki plit [On the hypothesis of plate tectonics], Geofizicheskiy zhurnal [Geophysical journal]. - 2013, - 35, no. 6, pp. 72–101 (in Russian). Gordienko V. V. Protsesu v tektonosfere Zemli (advektsionno-polimorfnay gipoteza [Processes in the Earth’s tectonosphere (advection-polymorphic hypothesis)]. Saarbrücken: LAP, 2012, 256 p. (in Russian). Grachev A. F. Mantiynye plyumy i problemy geodinamiki [Mantle plumes and problems of geodynamics] // Fizika Zemli. [Physics of the Earth], 2000, no. 4, pp. 3–37 (in Russian). Grasby S. E., Sanei H., Beauchamp B. Catastrophic dispersion of coal fly ash into oceans during the latest Permian extinction // Nature Geoscience, 4, 2011, р. 104–107. Hart S. A large scale isotope anomaly in the Southern Hemisphere mantle. Nature, 1984, v. 309, no. 5971, p. 753–757. Inoue H., Fuako Y., Tanabe K. et al. Whole mantle P-wave travel time tomography. Phys. Earth and Planet Iner., 1990, v. 59, p. 294–328. Khain V. E., Bozhko N. A. Istoricheskaya geotektonika. Dokembriy [Historical geotectonics. Precambrian]. Moscow, Nedra Publ., 1988. 382 p. (in Russian). Khazan Ya. M. Tektonika plit: «za» i «za» [Tectonics of plates: "for" and "for"] Geofizicheskiy zhurnal [Geophysical journal]. 2014. - 36, no. 5, pp. 170–173 (in Russian). Kobolev V. P., Orovetskiy Yu. P., Savenko B. Ya., Chulkov S. S., Burtnyy P. A., Karnaukhova E. E. Goryachie poyasa Zemli i Antarktandy (k probleme proiskhozhdeniya) [Hot belts of the Earth and the Antarcts (to the problem of origin)], Dopovidi NAN Ukraїni [Proceedings NAS of Ukraine], 2010, no.5, pp. 116–119 (in Russian). Larson R. L., Olson P. Mantle plumes control magnetic reversal frequency. Earth and Plant. Sci. Lett., 1991, No, p. 437–447. Litasov K. D., Shatskiy A. F. Sostav i stroenie yadra Zemli [Composition and structure of the Earth's core]. Novosibirsk, Publishing House of the SB RAS, 2016. 304 p. (in Russian). Maryama S. Plum tectonic. J. Geol. Soc. Japan, 1994, v.100, no 1, p. 24–49. Mikhaylova N. P., Kravchenko S. N., Glevasskaya A. M. Paleomagnetizm anortozitov [Paleomagnetism of anorthosites]. Kiev, Nauk. dumka Publ., 212 p. (in Russian). Orovetskiy Yu. P. Mantiynyy diapirizm [Mantle diapirism]. Kyiv, Naukova dumka Publ., 1990. 172 p. (in Russian). Orovetskiy Yu. P., Kobolev V. P. Goryachie poyasa Zemli [Hot belts of the Earth]. Kyiv, Naukova dumka Publ., 2006. 312 p. (in Russian). Orovetskiy Yu. P., Kobolev V. P. O retsenzii D.M. Pecherskogo na knigu Yu. P. Orovetskogo i V. P. Koboleva «Goryachie poyasa Zemli» [About the reviews D.M. Pechersky on the book Yu.P. Orovetsky and V.P. Kobolev "Hot belts of the Earth"] Geofizicheskiy zhurnal [Geophysical journal]. 2008m, 30, no. 4, pp. 163–166 (in Russian). Orovetsky Yu. P. Mantle plumes. Oxford & IBH Publishing CO. PVT. LTD, New Delhi-Calcutta, 1999, 245 p.
Pavlenkova N. I. Empiricheskie osnovy rotatsionno-flyuidnoy gipotezy global'nogo tektogeneza [The empirical foundations of the rotational-fluid hypothesis of global tectogenesis] Geofizicheskiy zhurnal [Geophysical journal]. 2004. 26, no. 6, pp. 41–60 (in Russian). Pavlenkova N. I. The Earth’s degassing, rotation and expansion as sources of global tectonics. New Concepts in Global Tectonics Newsletter, 2012. no. 63, p. 31–53. Pavlenkova N. I., Pavlenkova G. A. The upper mantle structure of the Northern Eurasia from the seismic profiling with nuclear explosions // New Concepts in Global Tectonics Journal, 2017, V. 5, No. 1, pр. 6–26. Pecherskiy D. M. Retsenziya na knigu Yu. P. Orovetskogo i V. P. Koboleva «Goryachie poyasa Zemli» [Review of the book Yu. P. Orovetsky and V. P. Kobolev "Hot belts of the Earth"] Geofizicheskiy zhurnal [Geophysical journal]. 2008. 30, no. 4, pp. 160–162 (in Russian). Puspito N. T., Yamanaka Y., Miyatake T. Three-dimensional P-wave velocity structure beneath the Indonesian region. Tectonophysics, 1993, v.220, pp. 175–192. Romanovskiy N. P. Tikhookeanskiy segment Zemli: glubinnoe stroenie, granitoidnye rudnye sistemy [Pacific segment of the Earth: deep structure, granitoid ore systems]. Khabarovsk, FEB RAS Publ., 1999, 166 p. (in Russian). Shen Shu-zhong, Crowley James L., Wang Yue, Bowring Samuel A., Erwin Douglas H., Sadler Peter M., Cao Chang-qun, Rothman Daniel H., Henderson Charles M., Ramezani Jahandar, Zhang Hua, Shen Yanan, Wang Xiang-dong, Wang Wei, Mu Lin, Li, Wen-zhong, Tang Yue-gang, Liu Xiao-lei, Liu Lu-jun, Zeng Yong, Jiang Yao-fa, Jin Yu-gan. Calibrating the End-Permian Mass Extinction. Science, 2011. Vol. 334 no. 6061 p. 1367–1372. Sovetskiy entsiklopedicheskiy slovar' [Soviet encyclopedic dictionary], Moscow: Soviet Encyclopedia Publ., 1990, 1632 p. (in Russian). Starostenko V. I., Geyko V. S., Kendzera A. V., Tsvetkova T. A, Bugaenko I. V., Verbitskiy S. T. Katastroficheskoe zemletryasenie 26 dekabrya 2004 g. u beregov Sumatry: prichiny, posledstviya i uroki [A catastrophic earthquake on December 26, 2004 off the coast of Sumatra: causes, consequences and lessons]. Geofizicheskiy zhurnal [Geophysical journal]. 2005, 27, no. 6, pp. 949–961 (in Russian). Storetvedt K. M. Geoscientific urban legends. New Concepts in Global Tectonics Journal, 2015. v. 3, no. 4, p. 516–528. Storetvedt, K. M. When global tectonics became a ‘pathological science’. New Concepts in Global Tectonics Journal, 2014, v. 2, pp. 106–121. Trubitsyn V. P. Reologiya mantii i tektonika okeanicheskikh litosfernykh plit [Rheology of the mantle and tectonics of oceanic lithospheric plates] Fizika Zemli, [Physics of the Earth], 2012, no. 6, pp. 3–22. (in Russian). Trubitsyn V. P. Tektonika plavayushchikh kontinentov [Tectonics of the floating continents] Vestnik RAN [Bulletin RAS]. 2005., no.1, pp. 10–21 (in Russian). Trukhalev A. I., Pogrebitskiy Yu. E., Belyatskiy B. V. Drevnie porody so Sredinno-Atlanticheskogo khrebta [Ancient rocks from the Mid-Atlantic Ridge]. Otechestvennaya geologiya [Domestic Geology]. 1993, 11, pp. 81–89 (in Russian). Tuezov I. K. Karta teplovogo potoka Tikhogo okeana i prilegayushchikh kontinentov: (poyasnitel'naya zapiska) [Map of the heat flow of the Pacific and adjacent continents: (explanatory note)]. Khabarovsk, FEB RAS Publ., 1988, 33p. (in Russian). Tyapkin K. F. Obshchnost' i otlichie geologicheskikh razrezov tektonosfery Zemli v predelakh kontinentov i okeanov [The generality and difference of geological sections of the Earth's tectonosphere within continents and oceans]. Geologiya i poleznye iskopaemye mirovogo okeana [Geology and Minerals of the World Ocean], 2012, 1 (27), pp. 22–33 (in Russian). Tyapkin K. F. Otsenka novoy rotatsionnoy gipotezy strukturoobrazovaniya v tektonosfere Zemli s pozitsiy dialekticheskogo materializma [Evaluation of a new rotational hypothesis of the structure formation in the Earth's tectonosphere from the standpoint of dialectical materialism]. Naukoviy vіsnik NGU [Scientific Bulletin NMU]. 2013, no. 1, pp. 11–24 (in Russian). Tyapkin K. F., Dovbnich M. M. Novaya rotatsionnaya gipoteza strukturoobrazovaniya i ee geologo-matematicheskoe obosnovanie [New rotational hypothesis of structure formation and its geological and mathematical justification]. Donetsk, Noulidzh Publ., 2009, 342 p. (in Russian). Vinogradov L. A., Kudryavtsev V. N. Rotatsionnaya gorizontal'naya sostavlyayushchaya izostazii [Rotational horizontal component of isostasy]. Apatity, Preprint of the Geological Institute of the Kola Branch of the USSR Academy of Sciences, 1987, 48 p. (in Russian).